Following their narrow defeat in Game 1 of the Hanley Energy IP20 Series, the Reds will be looking to get their first W of the competition against an experienced North West Warriors side on Friday evening at the Mardyke. The Reds’ inaugural fixture in the competition was headed to an exciting climax before bad light forced an early end which meant the Northern Knights emerged as winners by 9 runs on Duckworth Lewis. However, the experience will stand Ted Williamson’s side in good stead with the second of the two northern sides making the trip to the Mardyke on Friday evening. The Reds squad sees two changes from that which took on the Knights two weeks ago with Cork County’s Morne Bauer replacing his County teammate Muhammad Saddique, while Irish A and Clontarf paceman David Delaney replaces Cork County’s Aaron Cawley due to unavailability. Hard hitting all-round Morne Bauer will provide the side with valuable options with both ball and bat plus his experience of playing at the Mardyke will be equally invaluable. Likewise, Delaney provides the Reds with real firepower to their pace attack and his exploits at national, provincial and club levels are sure to prove key in the shortest format of the game. 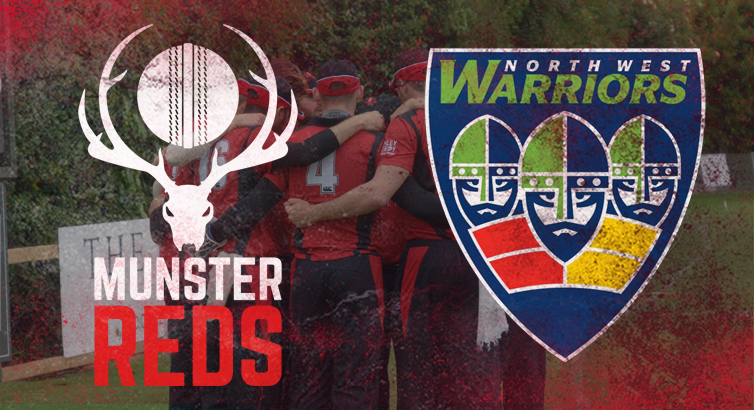 Both sides will be seeking their first win of the Hanley Energy IP20 Series with the Warriors going down to the Leinster Lightning by 56 runs at Bready which means the Reds are a place above them in the standings. The Warriors possess a strong bowling attack with openers Britton and Young complimented nicely by Stuart Thompson and Andy McBrine but the Reds will seek to exploit any weaknesses they may have in the batting line-up following their subpar performance against a strong Lightning attack. Stephan Grobler [c] (Cork County), David Delany (National Academy/Clontarf), Gary King (Cork County), Morne Bauer (Cork County), Yaqoob Ali (Co Kerry), Robert Forrest (Clontarf), Nicolaas Pretorius (Phoenix), Rory Anders (National Academy/Phoenix), Jamie Grassi (National Academy/North County), Max Neville (National Academy/Merrion), Harry Tector (National Academy/YMCA), Jack Tector (National Academy/YMCA).